Raising Jack With Celiac : Chick-fil-A's Gluten-Free Grilled Chicken Nuggets Giveaway! Chick-fil-A's Gluten-Free Grilled Chicken Nuggets Giveaway! This is very exciting news! Especially for us folks who visit Chick-fil-A once a week! Chick-fil-A is making strides to fight childhood obesity and therefore they have launched "One of America's Most Nutritious Kid's Meals", which is also GLUTEN-FREE. 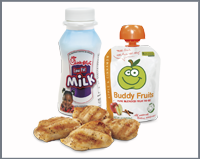 Grilled Chicken Nuggets, Buddy's Fruit Applesauce or Fruit Cup. Chick-fil-A's public relations team contacted me to see if I would be interested in a giveaway on my blog to help promote their new healthier, gluten-free option. And I said, "Yes!" I'm excited to share the news and give people a chance to try the grilled chicken nuggets kid's meal - FREE! 5 Free Kid's Meals to Give Away! Leave a comment below about Chick-Fil-A or Raising Jack with Celiac. To add more chances to win, simply "Follow" Raising Jack with Celiac as well. Winners will be randomly drawn and notified by email on Friday, February 10th. Thank you Chick-fil-A for creating a healthy gluten-free option for our kiddos. It makes life a little easier when you're on the go and needing a quick bite before gymnastics! Wow! That's fantastic news! Are they available at every Chick Fil-A? Awesome. That is awesome! I'm always wanting to bring the kids to CFA, but for myself, unless I want a salad each time, I find myself starving when I get home. As someone with Celiac, this is awesome news! Not only that, the health benefits of raising kids gluten-free are amazing! Way to go, Chick-fil-A!! We tried the grilled nuggets last week and they are GOOD. Claire likes them better than the regular nuggets. I've heard about the grilled nuggets. I bet my two year oldc would love them! Two thumbs up for CFA then - Your gluten-free boy can eat there and my peanut-free boy can, too. As for these nuggets, I ordered them for Anna and she ate not one bite. So I did the deed for her. Yum, they were. we like CFA especially the waffle fries. it is good to see healthy choices for kids. I saw this on their menu yesterday and was very excited for this healthy alternative. I frequent CFA so much sometimes my van drives there by itself :) I would love to win this giveaway!!! This is great. But what about the adults? Do they offer a gluten free Adult meal? CFA has the best food. Just wishing they were open on Sundays so that we could go after Church! saw your post on GTP.This is awesome. So few fast food rest have or wel... very poorly advertised, gluten free options. They put me on gluten free diets all the time thinking I have celiacs diesease (all testing has been negative tho). always hard finding good things to eat. will be trying your recipes !! Love CFA!! I have always admired their high standards. My granddaughter loves their play area, and the food is excellent. Doctors first thought I might have Celiac disease, but found ulcerative colitis instead. So glad to see that restaurants are really trying to accommodate the public in this way.I like too that the one near me supports the Vanderbilt Commodores. Go Dores!!! Love CFA my granddaughter loves going there and the food is very good too!! Chik Fil A is my favorite fast food restaurant! Hi Sarah! Could you please email me your address? raisingjack@gmail.com - you won a free kid's meal and I need your address! For some reason, I'm unable to "reply" to your post. Thk U!